Canadian consumers are increasingly looking for better rewards programs when it comes to choosing a credit card, according to a new study that shows that nearly half of the people that switched cards in the past year did so for a better plan. Of those who switched cards, about 48 per cent did it in search of a better rewards program, according to a study released on Monday by market research firm J.D Power. The firm did an online survey in May of more than 6,000 customers who used major credit cards in the past three months. Since the survey was conducted online, it is not randomized — and as such does not have a margin of error that can be expressed like it can be in randomized telephone polls. 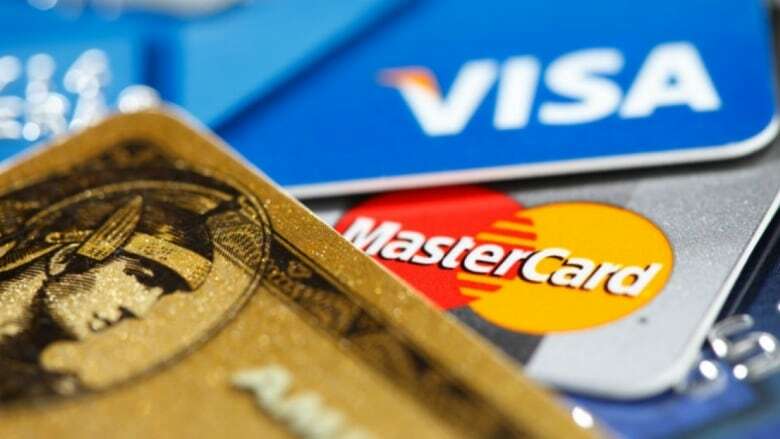 The survey showed that 87 per cent of credit card users were enrolled in a rewards program, and on average, they spent about $600 a month on their primary credit card. "There's more to a satisfying rewards program than just the amount of points, miles or cash card holders can earn," said Jim Miller, vice-president, banking and credit card practice at J.D. Power. "Understanding how to redeem rewards — and having redeemed rewards recently — has a significant effect on satisfaction and loyalty levels." Nearly two-thirds of the users said they understood how to redeem rewards offered by their credit cards at 64 per cent, but there was still more than one-third of the respondents that did not understand the process. Laurie Campbell, CEO of Credit Canada, said if rewards are the main driver for using certain credit cards over others, and the user doesn't know how to redeem those points to unlock the savings or benefits, then the rewards lose their value. "It's like owning an amazing car, but not having the keys," Campbell said. "If a third of customers don't know how to redeem points on their cards, then there's a third of customers who are using rewards cards, and maybe even paying an additional fee for those rewards with no benefit whatsoever." Added to that, Campbell said there is a good chance some customers are carrying a balance month over month on these credit cards costing them a significant amount in interest. Meanwhile, Miller said those customers that understood how to use mobile applications for their credit cards had a greater level of satisfaction. "Overall satisfaction is 77 points higher among card holders who completely understand the mobile app than among those who do not completely understand the app," Miller said. "To gain a competitive advantage, issuers should focus on improving their mobile offerings and on educating their card holders about the benefits and security they provide." The top credit card in the country when it came to overall customer satisfaction was President's Choice (PC) Financial, followed by American Express, Canadian Tire, Capital One and BMO Bank of Montreal. "Customers have a good understanding of how to earn and redeem rewards [on PC Financial]," the study said. "PC Financial receives the highest rating for amount of rewards earned per dollar spent." 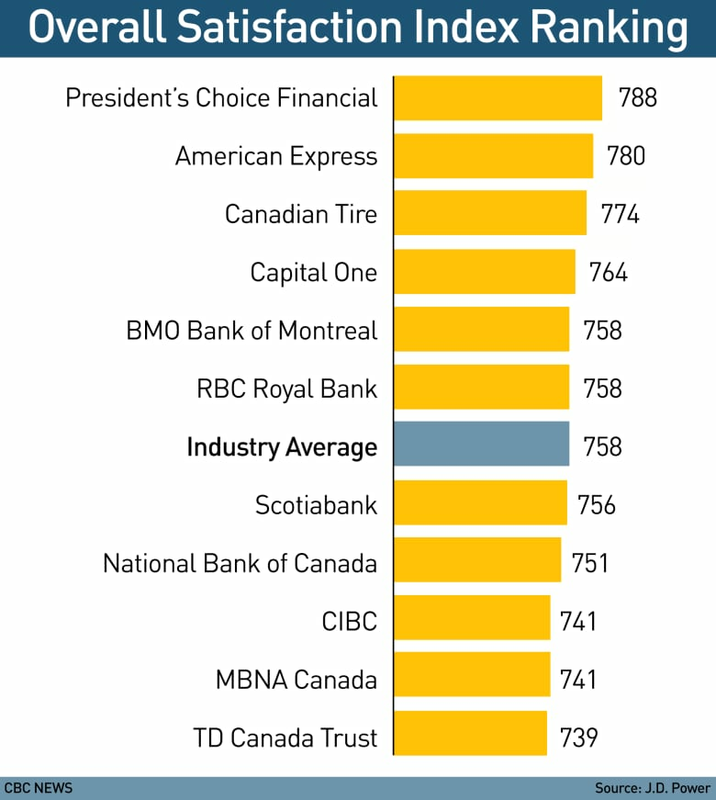 Credit cards for most big Canadian banks were lower down on the top 12 list with Scotiabank, National Bank of Canada, CIBC and TD Canada Trust all in the bottom half of the rankings. "For retail bank issuers, an increased focus on improving customer understanding of benefits and reward programs and card terms can have a considerable impact on satisfaction among all customers," the study said. But, Campbell warned that while freebies and rewards are wonderful if you'll be spending that money regardless, customers should not lose focus. "At the end of the day, a free $900 plane ticket doesn't justify paying thousands of dollars in interest," Campbell said. "We often hear that they [consumers] got the credit card out for the rewards, and then used it excessively to build up points, sometimes even buying things they don't need or want. "In the end if they are paying high interest, it makes no sense," she added.